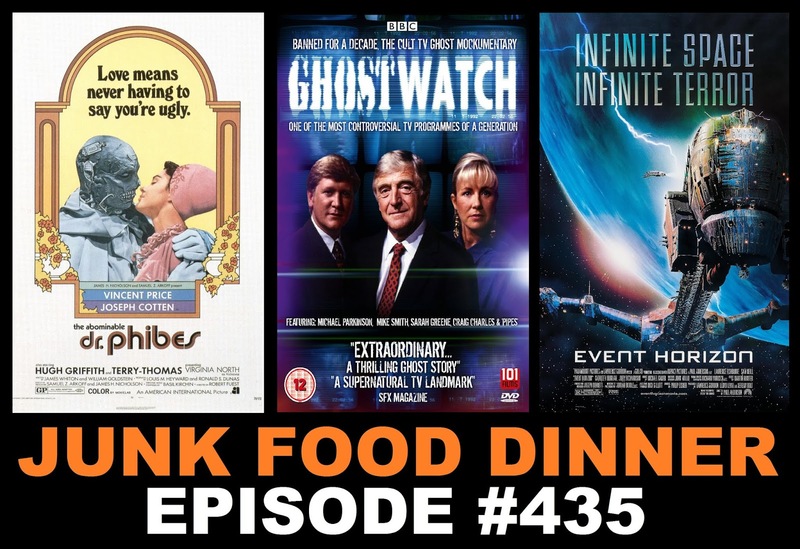 This week on JFD, it's the second week of Schlocktober and we're partying with three movies picked by our world class Patreon donors. Up first, Vincent Price plays a music and theology-loving mad man who is exacting revenge on a group of doctors who couldn't save his wife in 1971's The Abominable Dr. Phibes from AIP. Then, we watch a 1992 British television special called Ghostwatch where actual BBC presenters pretended to be investigating a haunted house on Halloween and managed to fool a good portion of the UK viewing audience in the process. And finally, Sam Neill and Laurence Fishburn lead a crew of space explorers on a mission to track down a lost space vessel. But when they find it, it turns out the ship is haunted and causes some crazy reactions from the crew in Event Horizon from 1997. All this plus witty banter between friends, difficulty pronouncing the word "abominable", Hell Fest chat, Travis from GWARcast calls in, JoBeth boners, Halloween sequel updates, Juggalo dropkicks, Nerd News, blu-rays and so much more.